From the Master Gardener at Washington Bulb Co., Inc.
Tulips are one of the easiest flowers to grow successfully in the garden. Plant bulbs in the fall and even a novice gardener can expect to see beautiful flowers in the spring! Tulips are classified as a perennial flower. This means that a tulip should be expected to return and bloom year after year. But we all know that this is not always the case. If tulips are perennials, then why don't they behave as perennials? The answer is really quite simple. Tulips are native to Eastern Turkey and the foothills of the Himalayas. They will perennialize best in conditions that match the cold winters and hot, dry summers of their native region. In addition, species and botanical tulips perennialize best. Hybridizing sometimes diminishes a tulip's ability to perennialize, other times it enhances this ability. Growers have been able to succeed in places like Holland and the Skagit Valley by digging their tulips every year and giving them temperature treatments in the summer months that manipulate the tulips and somewhat replicate what they would be receiving in their native region. These treatments have been developed over hundreds of years and they are still being modified today as new varieties are being developed. Using this knowledge helps growers to expand their stocks and grow big bulbs, while the home gardener may have less success. Understanding Tulips: A further explanation of what happens to tulips during the growing cycle would help us all to understand tulips better. To begin with, tulips are planted in the fall and they immediately start to root. They root slowly in the winter months and are receiving cold temperatures that stimulate them to sprout in early spring. (In warmer climates, we artificially give them these cold temperature treatments in our coolers.) As the temperatures get warmer, the tulips start to grow rapidly and eventually they bloom. At this time, the bulb that was planted is totally used up and actually starts to disintegrate. New bulblets form and start to grow - this period between blooming and the plant dying is referred to as the GRAND PERIOD OF GROWTH. This is when the energy flow reverses and starts to go downward to build new bulbs instead of upward to form flowers. Growers top the tulips about three weeks after blooming for two reasons: First, they must remove the flowers before the petals fall in the foliage. If they were to ignore this step, the dropping petals would cause the tulip plants to rot and die down before the new bulb(s) had a chance to grow. Topping also removes the seedpod from the plant, which if left would rob some of the energy that would otherwise go to the new bulb. 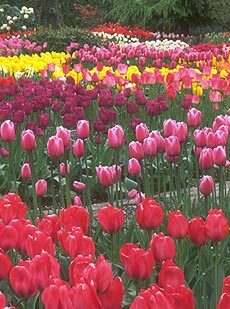 Six to eight weeks after removing the blooms, growers usually dig the tulips and the process of drying, cleaning, grading, and temperature treating takes place. When deciding which varieties to raise, growers must evaluate many qualities of each cultivar. Some of these are color, height, stem strength, plant structure, whether it forces, disease resistance, skin quality, how it grows, etc. Growing qualities are very important to the grower and every variety has different qualities. Some varieties make many new bulblets for every bulb planted. Others make very few or even only one bulblet for every bulb planted. Varieties that make many bulblets are not desirable because they usually don't produce many saleable bulbs. This is because the energy being received from the plant is divided into too many bulbs. Others that make few bulblets are not desirable either because they may yield plenty of saleable bulbs and not leave enough planting stock to keep the stock going. The grower has to pick varieties that meet all the other desirable qualities and at the same time have the growing qualities of producing big bulbs and enough planting stock to continue the stock. Experience has taught us that the best varieties for home gardeners are ones that make fewer bulblets. These bulbs tend to perennialize better because the energy from each plant goes to fewer bulblets and these then stand a better chance of growing big and returning year after year. This is especially true in gardens where growing conditions may not be as ideal as in a grower's field. 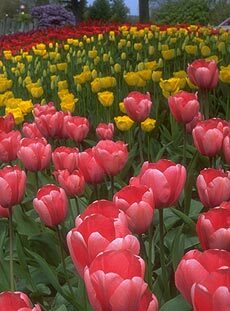 Species and botanical tulips also perennialize well because they are very close to native strains and have high disease resistance. They are usually smaller and less spectacular, however. Always plant tulips in a well-drained and airy soil. Wet soil promotes fungus and disease and can even rot bulbs, especially tulip bulbs. Wet soil can also cause bulbs to drown out which is actually due to suffocation. Suffocation can also be caused by tight soils that don't hold much oxygen. Adding compost and coarse sand to a soil will make it more airy. We recommend raised beds in wetter areas and suggest that you have at least a 10-inch depth of loose airy soil. Proper soil drainage is very important when planting bulbs. Fertilize and water bulbs when planting. Though too much water is not good, sufficient water at the time of planting is necessary to get them growing and to ensure the start of a strong root system. Fertilizing in the fall with special bulb fertilizer is always a good idea, especially if you haven't dug your bulbs and are trying to get them to perennialize.